I haven't had much time to quilt lately, but I made this doll quilt for an exchange with a friend. I called it "Rain or Shine" because that is just the type of friend she is, there through it all. It's made in her favorite colors. It's my first try at more traditional quilt binding, and only my second quilt (my first one was all hand stitched and hand quilted) this one is machine assembled, hand quilted, and the embroidery patches and yo-yo are hand appliquéd. I had never made a yo-yo but decided to give the heart-shaped one a try and it worked! I am now a little bit hooked on these small quilts! I've already got a few others planned. 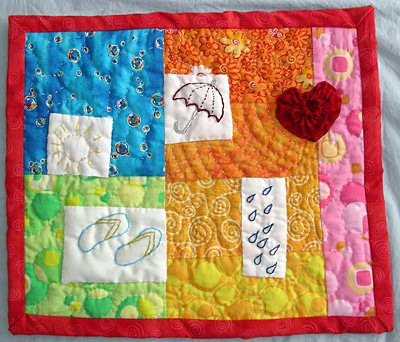 What a bright cheery little quilt. You did a great job. Oh, this is so very cute! lovely. That is just so sweet and wonderful! Love the colors and fabrics and the embroidery. A wonderful gift for a friend! That's a sweet little quilt. I like the bright colors. I love the colors and the stiching is great! What a beautiful sentiment for a friend who is there through it all. Love it! Great little quilt. So cheerful! How cute! and what a sweet sentiment. Everyone should have a friend like that! The love shines through - rain or shine, Love the emphasis you placed on the heart. Thank you for all the nice comments and for stopping by to visit! Love this quilt! It's absolutely adorable! this is a fun little quilt. your friend is lucky to get this as a gift.